It was a clear, cold and quiet morning in the Tokyo area. 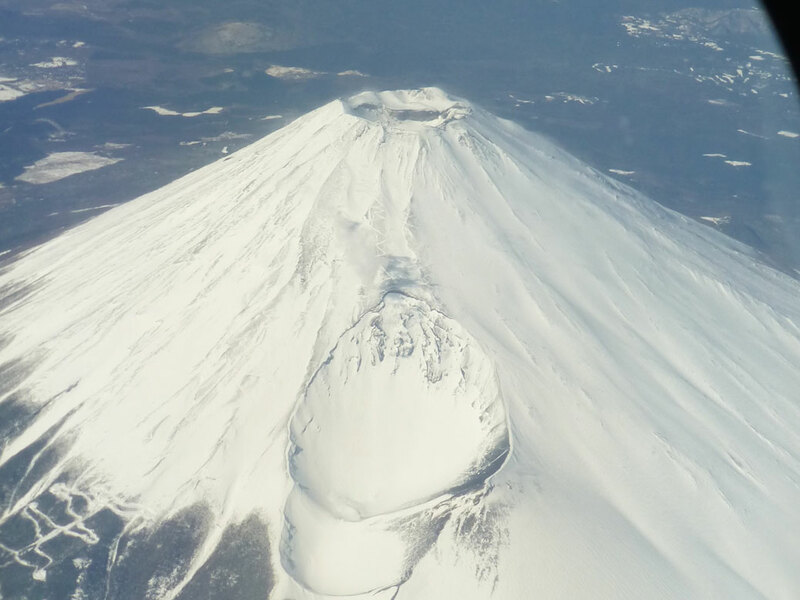 As we rode the train to Narita International Airport, we could see Mt. Fuji in the distance. Our flight to Delhi was 10 hours, but the Boeing 787 Dreamliner was like flying in a hotel… a couple meals, a couple movies (including a charming Bollywood flick) and wide, comfy seats. Easy. Those would be the last moments of calm for awhile. We arrived at Delhi’s Indira Gandhi International Airport after sunset on a warm February evening, the modern Terminal 3 offered no clues to what was waiting outside. When we stepped through the doors, we were met by chaos. Dozens of taxi drivers hovered outside the terminal approaching aggressively while repeating “Where you going? Where are you staying? You need a hotel? You need a tour?” Fortunately we’d read that there’s one government-run taxi stand where you pre-purchase your fare so as to not be cheated by the driver en route to your destination. We drove toward our hotel, the lanes painted on the highways serving no purpose other than decoration. Vehicles weaved in and out, announcing their presence with a series of honks. Pedestrians waited for an opportunity to cross the eight-lane highway, edging through traffic like a real-life game of Frogger. A man led his two camels alongside the busy road, likely to the nearest river to graze. Our hotel was in central Delhi. The hotel porter immediately wanted to set us up with a tuk-tuk (auto-rickshaw) tour of the surrounding area, but we opted for sleep instead. 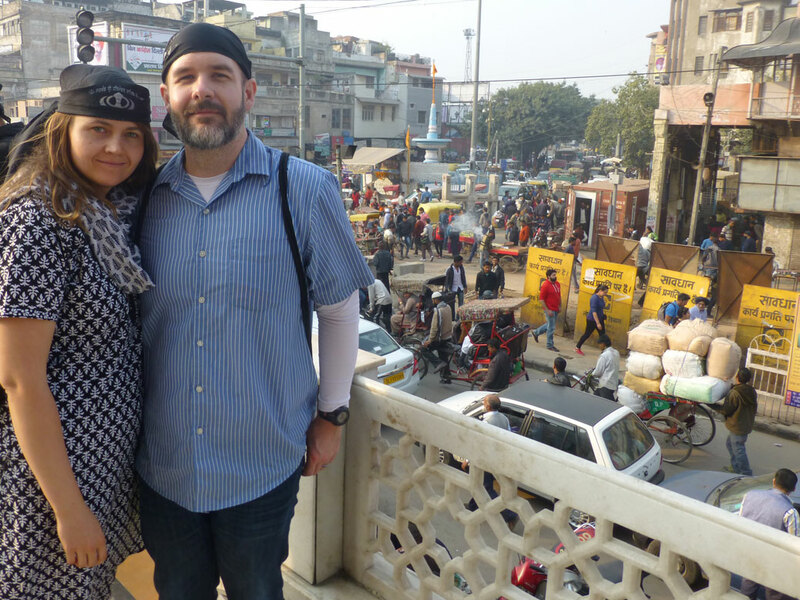 In the morning, we walked for a bit, trying to find one of Delhi’s many outdoor markets. Shopkeepers do their best to keep the sidewalks and gutters clean, but trash still piles up in the streets. Cows, considered sacred in Hindu culture, wander the streets as freely as people and do their business wherever they see fit. 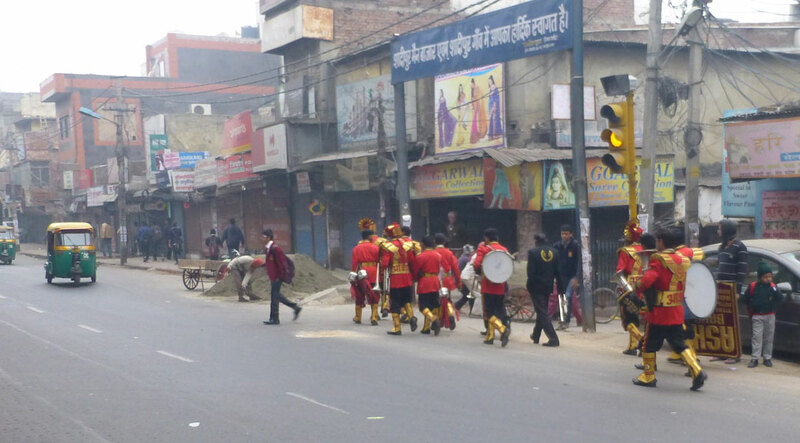 A school marching band walking down Patel Rd. in Central Delhi. Soon, Delhi began to wake. A marching band walked by—young musicians on their way to school. The temples began to buzz as people headed to morning worship sessions. One by one, the doors on the shops opened up. 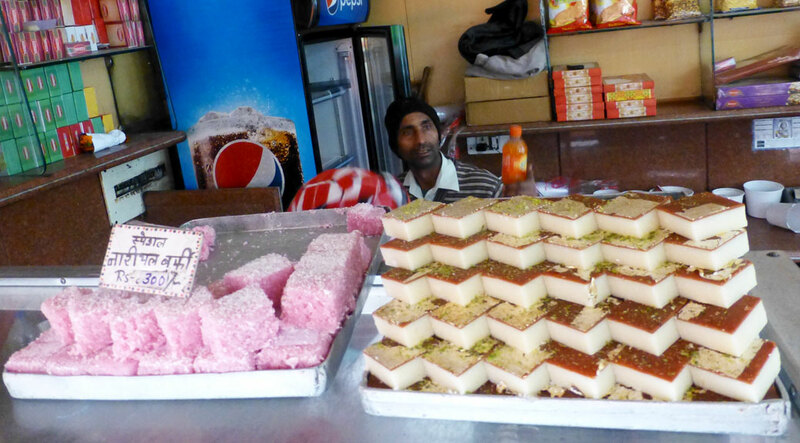 Lacking a good breakfast option, we bought a box of Indian sweets called barfi from a vendor near our hotel—the beginnings of “a banner day for nutrition” says my wonderfully witty wife. While we waited for our barfi, a group of boys headed to school stopped to say hello. “Will you take our picture?” one of them asked. This was the first of many such requests. Not “Will you take a picture with us?” or “Can we take your picture?” but to specifically photograph them and show them the picture. Experience the tuk-tuk ride for yourself! We returned to our hotel and, in short order, we were approached by the local tuk-tuk magnate. His fleet of auto rickshaws were waiting around the corner and for just 200 rupees (about $3.20), he’d take us on a tour of the local markets. 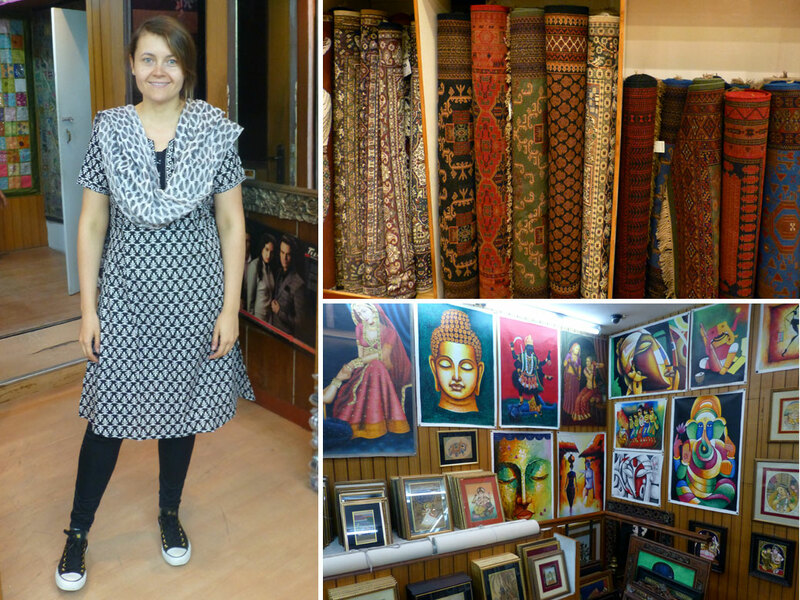 We jumped in the back and began weaving through the streets of Delhi. Along the way, he stopped in a park where rhesus monkeys sat along the wall. A nearby vendor sold bananas you could feed to the monkeys, but our driver pulled out some day-old chapati instead. 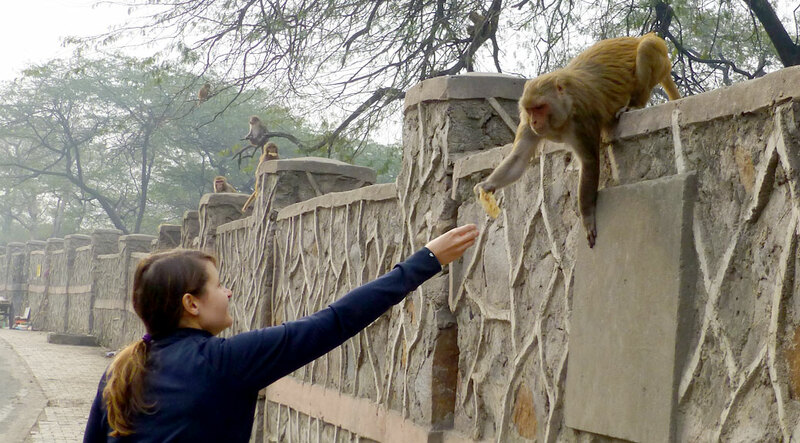 The monkeys were clearly accustomed to being fed by humans as they reached down from the wall and took the pieces of bread from our hands. Those 200 rupees were really a down payment for a lesson in Indian economics. The “tour” took us to three shops where, if I had to guess, the driver had a deal with the shopkeepers—”I’ll bring you tourists, you give me a cut of the sales.” But, he also gave us a nickel tour of Central Delhi and took our picture “driving” his tuk-tuk (see top photo). The shops are elaborate labyrinths with only one way in and one way out. To reach the exit, you must navigate through scarves, clothing, knickknacks and carpets. Each shop offers a riff on a theme. The scarf salesmen pull threads from the weave and burn them at the edges to prove they’re really cashmere/pashmina/silk (because they’re animal hair, the fabric singes where artificial fabrics burn like plastic). The carpet salesmen explain thread counts and show how the colors change depending on which direction you look at them. Elephants tchotchkes are carved from teak wood or camel bone and the symbolism is described by the shopkeeper in depth. The driver took us from one shop to another before we finally cried “Uncle.” We sheepishly asked him to take us to the McDonald’s restaurant we’d see on Google Maps nearish our hotel. He scoffed and rolled his eyes at the Americans traveling all the way to India to eat fast food, so I felt the need to explain. 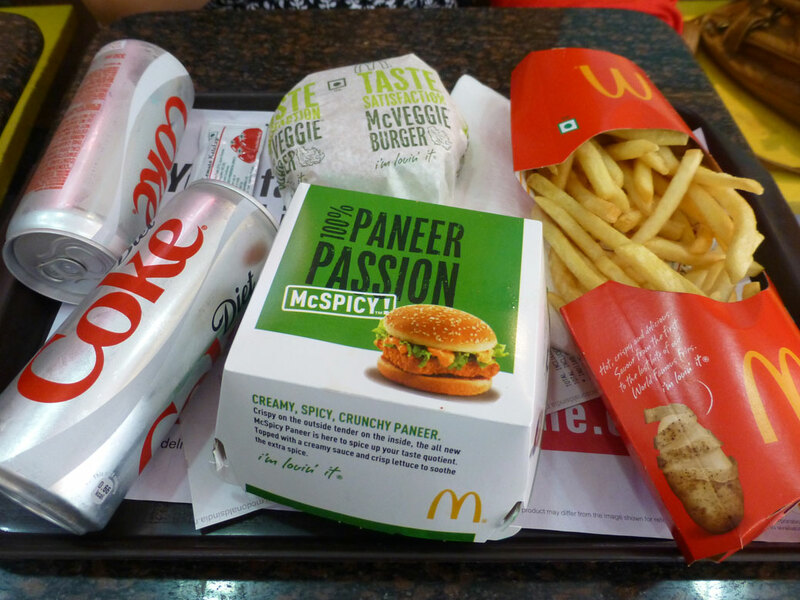 McDonald’s doesn’t typically offer vegetarian options (even the fries contain beef tallow), but since 40 percent of India’s population is vegetarian, the global chain offers up alternatives to meet the demand. After lunch, we returned to our hotel to rest up before meeting our tour group for the first time. Our tour company’s promise of small groups was a big draw for us. We started as a group of six—joined by two teachers working in China, an American from the NYC area and an Australian from the Melbourne area. Four others would join us later, having toured Delhi as part of another tour. Our tour guide was fantastic. A native Indian from nearby Jaipur (about 170 miles southwest of Delhi), he knew the history of the areas we visited and was willing to answer all of the questions we threw his way. After taking care of a couple paperwork things, we loaded into tuk-tuks and headed for Old Delhi. Established in the 1600s, the area is considered the heart of Delhi. 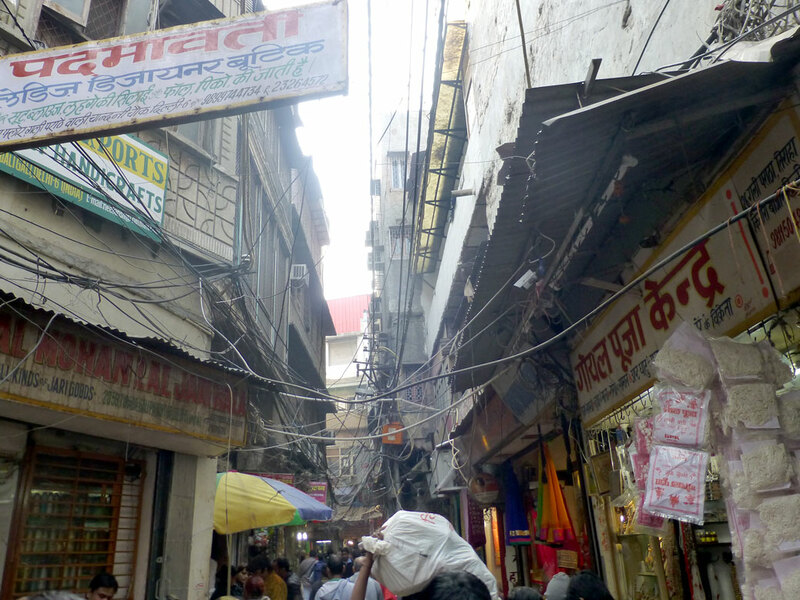 We wandered through the narrow alleys, past food stalls and more scarf shops, eventually exiting near the steps of Jama Masjid, the largest mosque in India. Note: Generic photos ahead. We tried our best to photograph the religious locations without capturing the people in the middle of their worship. 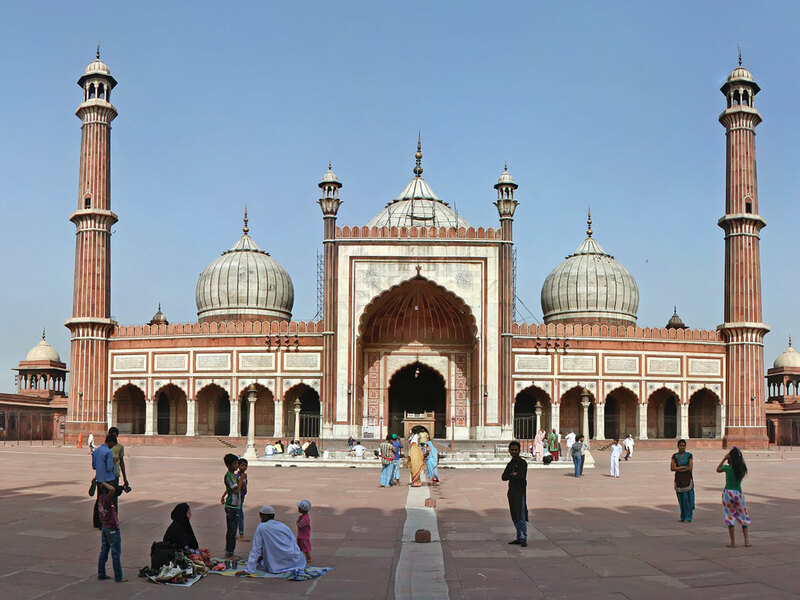 Although nearly 80 percent of the population identifies as Hindu, Islam is still a prominent religion in India. When India gained independence from Britain in 1947, it also lost a large portion of its land and Islamic population as Muslims moved west, creating Pakistan. The mosque still makes daily calls for prayer and closes to tourists during prayer hours. From the mosque, we made the short walk to Gurudwara Sis Ganj Sahib, Delhi’s primary house of worship for the Sikh religion. When you see the stereotypical depiction of an Indian man, he’s usually wearing a turban, one of the Five Ks of Sikhism. Sikhism is unique among Indian religions for many reasons, but its treatment of women stood out to me. While women are treated as subordinates in Hindu and Islam, the scriptures of Sikhism demand that women and men are treated as equals. We were given scarves to put on our heads prior to entering the worship area. The ornate, gold-laden prayer room had a scattering of midday worshippers with traditional music played live in the background. Sikhs don’t have ordained priests, so nearly any Sikh can lead the congregation as long as they meet some minimum qualifications. The charity of the temple is on display in a large dining room alongside the main prayer hall. Anyone can join in the preparation and consumption of the meal. 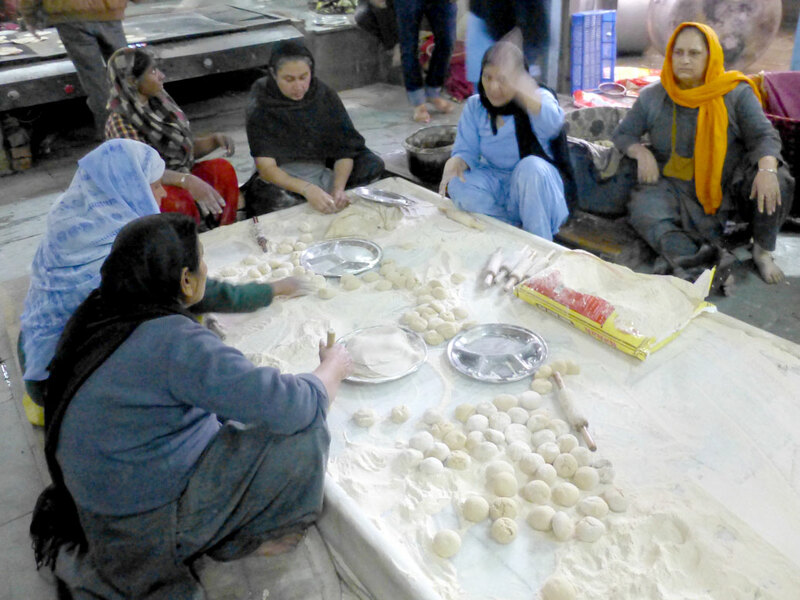 While men typically don’t participate in meal preparations in India, they were working alongside the women to prepare the large quantities of food for the congregation. After a long afternoon of sightseeing, we had a group dinner back at the hotel and headed to bed. We’d be on an early morning train to Agra the next day to see what we all came to see: Taj Mahal.